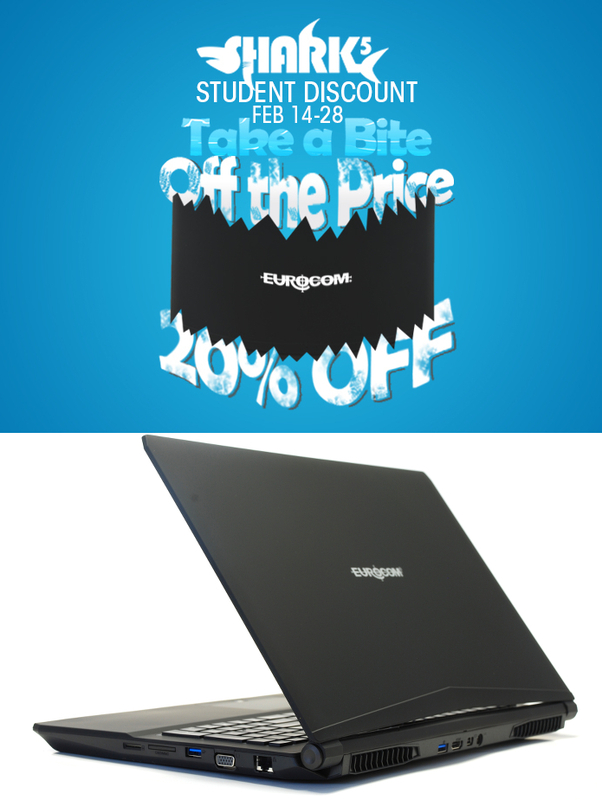 The EUROCOM Shark 5 is the perfect laptop for students with the combination of a massive 20% discount and a load of amazing features. The Skylake based Shark 5 is slim (28.5 mm/1.1 inch), lightweight (2.5 kg), sleek and powerful, with on-board GPU and CPU for maximum battery life and an internal Ultra Slim Optical Drive. A beautiful soft rubber coating is a perfect way to finish off the Shark 5 in a high quality, beautiful fashion. The EUROCOM Shark 5 has ample performance for nearly any task and is packed with features that make the EUROCOM Shark 5 perfect for students. What makes the EUROCOM Shark 5 perfect for students? EUROCOM Shark 5 Product Page. The Shark 5 is prewired for LTE or UMTS/HSPA/3G/4G card module support, through an M.2 slot, so students can have a reliable WAN internet connection on the go.